For those of you interested this is the text from the Little River CDP Coastal Development Permit for the Little River Project that pertains to our trails. 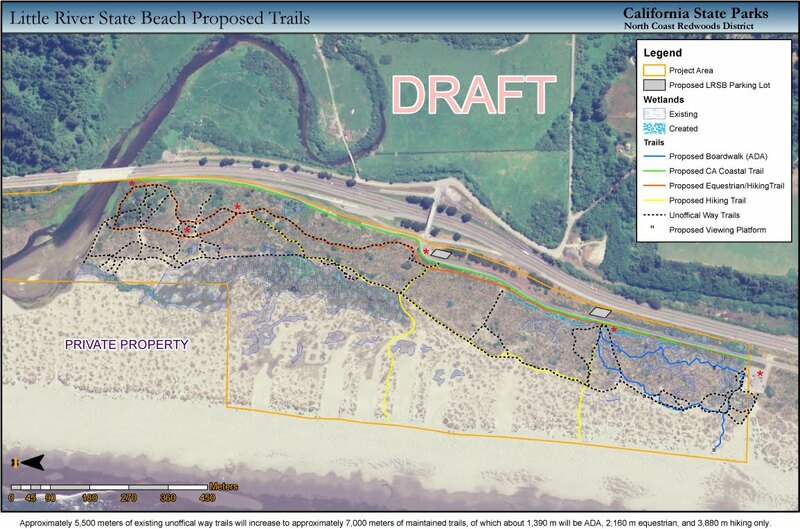 Note that the proposed trail does not even connect to the county backdune trail to the south or even to the beach. 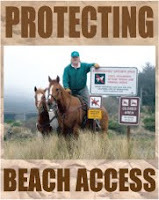 It is important that they have recognized the historic use of horses on these trails. That makes it hard to kick us off. This comes from a rather large document but if anyone wants it I'll send it. only of striping a bike lane within the paved areas of the existing frontage road and its shoulder outside of any ESHA and designating portions of the trail system as part of the Coastal Trail. Fourth, the proposed boardwalk construction will be located within the dune ESHA, but it will be located within existing way trails and limited in width to the minimum width necessary to meet ADA requirements. Fifth, the two proposed bridges will completely span the dune wetland areas they cross without any fill in the wetlands. Finally, the proposed loop interpretive trail will include interpretive signs to educate users about the natural dune environment they are passing through. Just dumb. A great trail in a gtea`t place at no cost. 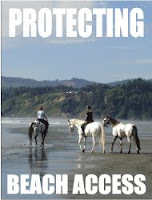 What does state parks do? No wonder they are closing other parks. DUMB!